We have always had a soft spot for cats. We've had quite a few around the house since we started living together in 1975. At this moment we have 2, of which one is an almost 6 months old rascal, that still needs to learn some house rules. So it's no surprise that Miriam has a sub-collection of "cat decks", drawn or photo's. On the last day of this month a new addition for her cats folder arrived. It was a surprise gift that Joop had ordered from Apenas Livros, a publisher in Portugal. The woman in charge there turned out to be Fernanda Frazão, who had organized the IPCS convention in Lisbon in 2010, during which we had briefly met her. The deck was published as "Gatos Baralhados" in 2018. Each card has a different illustration, with a cat of course, by Susana Resende. It was the only modern deck with jokers that we have received this month, so the choice was very easy again. It was a sad month, as I had to say farewell to my Miriam. She passed away on the 11th. Although we had foreseen that the chance of growing old together was rather slim, we both thought that this hospital admittance on the 6th would end like all those times before: back home on the couch within 2 or 3 weeks. But this time she had caught a virus, with which her lungs couldn't cope. Her death came swift and soft. I was there to hold her hand until the last breath. Collecting jokers was Miriam's part of our shared hobby. I have always been more interested in complete decks, but besides this shared interest Miriam had several sub-collections too. 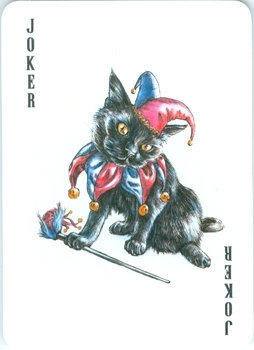 Besides the above mentioned cat decks folder, she also had a folder with aces of spades from incomplete decks that we had had, a folder with backs that had playing cards or suit symbols and a folder with backs with cats, of course. 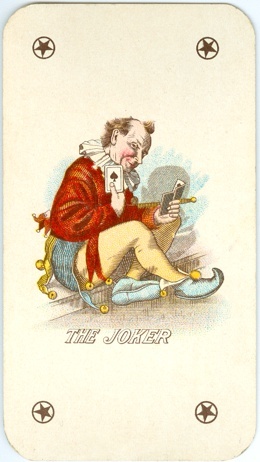 But when she started to collect non-standard playing cards, she simultaneously began collecting single jokers too. In those days there were still a good number of bourses for playing cards and jokers in the low lands. Year in year out we visited the bourses in Utrecht and Nieuwerbrug, but also those in Antwerp and Brussels. Nowadays three of these four no longer exist. Most of the collectors do their thing online now. Miriam never was very happy with this. She enjoyed meeting the other collectors face to face, talk about jokers, learn about them in discussions. She was a people's person. I will continue to select a joker each month here in her remembrance. This month I haven't bothered myself with playing cards, but before Miriam's hospital admittance I had bought this single card on eBay. 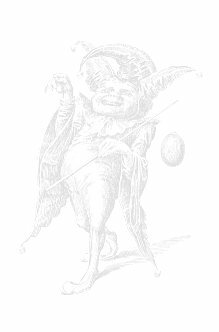 It's a joker, but is it? 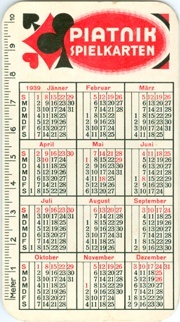 The back of the joker shows a calendar card (1939), advertising Piatnik playing cards. Would you add it to your collection? Miriam's judgement is missed here.... immensely. This month I have spend a few days integrating Russian decks from the LB collection into our own and I have started doing the same with the decks from the Baltic states. I had selected a nice Latvian joker, because I thought that I hadn't bought any new decks or jokers this month. But..... I was in Paris for the exchange meeting of the French collectors on the last day of the month. The Saturday before was spent on the usual two "brocante" markets and on the one at the Port de Vanves I found an intriguing deck with a joker that I hadn't seen before. The courts had a standard English pattern and the deck was published as "Emerald" (with "superfine poplin finish"). On one of the sides it said "made in Ireland", but on the other side "made in Free State". According to Wikipedia the Irish Free State existed between 1922 and 1937 and consisted of 26 of the 32 counties. The other 6 counties formed Northern Ireland. The Free State was established as a Dominion of the British Commonwealth by a treaty after a 3 year independence war between the IRA and the British Crown forces. The joker looks as if the sitting Waddington joker has just stood up and enjoys this new position. The cards and box look professional, but Waddington never had a production plant in Ireland. 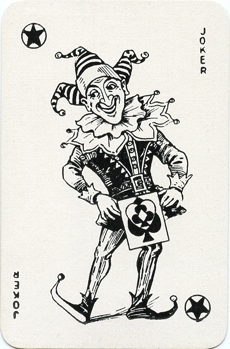 Maybe the Irish Playing Card Co. (producer of a "Heroic Set" of Irish playing cards around 1910) was still active in the 1920's and designed this joker just to make fun of the British one.